Tesori has nearly 7,000 square feet of indoor and outdoor living space, with ocean views and modern amenities throughout. The villa is fully air-conditioned, which is always a plus, and even has a generator for back-up power. Tesori would be great for a vacation with friends, because each bedroom has an ensuite bathroom, walk-in closet, TV, and queen or king-sized bed. Couples will also love how the bedrooms are separated throughout the property. Three are upstairs, each with their own private balcony, one is on the main level, and one is in its own studio apartment on the lower level. Everyone in your party will have plenty of space to kick back and relax in paradise at Tesori Villa. Great for families with small children! 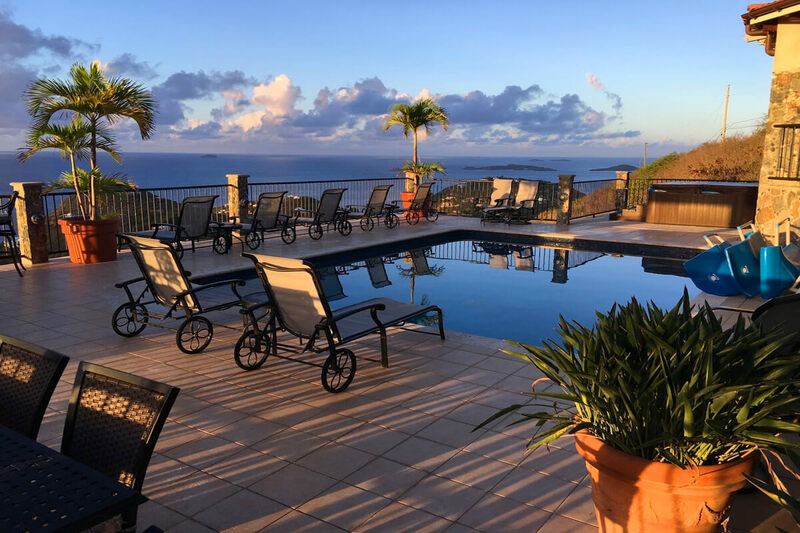 Tesori Villa is located in Rendezvous Bay near Ditliff, with gorgeous views of the ocean and several surrounding islands. This fully air-conditioned vacation rental has three stories of living space, and is bordered by lush gardens. Tesori has a gorgeous outdoor space, with an expansive pool deck and lounging balcony. The pool deck is framed with wrought iron railing, and seems to float above the sea. Guests can enjoy a poolside snack in the gazebo, or grill lunch on the BBQ and eat at the table. The gazebo has bar seating, a commercial 4-burner grill, a blender, an ice maker and a sink. There are several loungers to sunbathe on, and a Jacuzzi to soak in. The balcony above has a covered living area, with plenty of seats for everyone to gather at the end of the day and play cards, talk, and watch the sunset. There’s also a telescope on the balcony, so guests can explore the horizon. The main level’s expansive living area has cypress ceilings and mahogany rafters, with Italian tile flooring and oriental rugs. Guests can relax into the oversized bamboo sofas and watch a movie on the 42” plasma TV, or play a board game in the center of the room. The gourmet kitchen has cherry wood cabinetry, bar seating, Venetian granite countertops, and stainless steel appliances. A large walk-in pantry, wet bar with wine cooler, and a mahogany dining table round out the space. The main level suite is next to the kitchen, and has a queen-sized bed, walk-in closet, TV, and ensuite bathroom. An interior staircase leads to the three upper level bedrooms. The master suite has a king-sized bed, sitting area, TV, and ensuite bathroom with a walk-in closet. Queen suites sit on either side of the master suite, each with a TV, walk-in closet, and ensuite bathroom. All three of the bedrooms have private balconies with seating and ocean views. The fifth bedroom is located below the pool, with a daybed, full kitchen, ensuite bathroom, plasma TV, and a dining nook. Guests can borrow the villa’s snorkeling equipment to explore Rendezvous Bay’s beaches and reefs. Tesori has a lot of privacy, but is still within a 15 minute drive to North Shore Beaches. Rates do not include: tax of 12.5%, damage waiver fee of $50.00, island charges of 5%. Nearest beaches are Klein Bay and Chocolate Hole. There is a 12-17 minute drive to North Shore beaches. Upon arrival guests will be met at the dock by a member of the villa management team. Once the rental car is secured, they will be escorted to their villa for an orientation of the property. Car rental, private chef, butler, server, daily maid service, grocery and beverage shopping (pre-arrival and during your stay), liquor and wine delivery, nanny service, spa services, yoga and personal training, photography, and private airport transfer/car service can be arranged for an additional fee.